Anyone who knows me on Facebook probably realizes by now that our family loves enchiladas. I started making them nearly 10 years ago and have customized the recipe to fit changing tastes, health situations and general preferences. 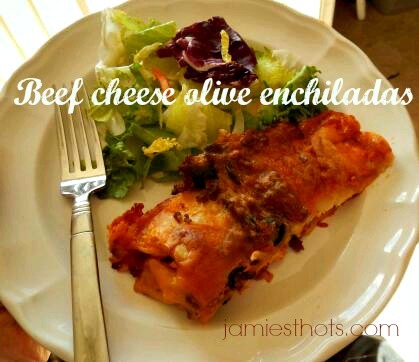 I blogged my enchilada recipe in 2010 but it’s changed enough and is requested enough that I thought I’d revamp the post (including the much more appetizing picture!). At the risk of sounding prideful, these enchiladas are pretty darn popular. I usually get requests to make them for potlucks, group meals and well, just at our home. When I make the enchiladas for larger groups, I usually do it casserole style, which I’ll share after the traditional method in this blog. Like most of my recipes, the measurements are not hard and fast. Depending on your personality, that could make it easier or harder for you to follow! Preheat oven to 350 or if you’re in more of a hurry, 375 degrees. Mix in the (drained) olives. Mix in about 1/3 of the can of enchilada sauce (if you’re using two smaller cans, about half to 2/3 of one can). Mix in about a handful or two (depending on preference) of the shredded cheese to complete the meat mix (it should be enough cheese that it’s a cohesive but not “cheesy”). Pour 1/3 of the enchilada sauce in the bottom of the 11×17 dish (I use Pyrex. If you use a metal baking pan I recommend either using lots of cooking spray or lining it with aluminum foil). Place about a half a cup of the meat mix into each tortilla and folding in the ends towards the center then rolling each tortilla (to create a burrito type thing). Place the enchiladas side by side in the pan as you roll each one. Once you fill up the lengthwise direction, you should be able to fit two more end to end at the top. If you use a bigger size tortilla this will not be the case. If you have any meat mixture left (I usually have about a cup left), spread it evenly over the rows of enchiladas. Pour the remaining enchilada sauce over the entire pan of enchiladas. Bake in the oven for 30-45 minutes. The amount of time largely relies on which temperature you chose. I prefer 350 degrees for about 40 minutes. Start checking the enchiladas at about 25-30 minutes and they are done with the cheese is melted, the edges of the exposed tortillas are starting to look crispy, and the sauce is bubbling. Serve with salad, tortilla chips or whatever! This version of the recipe is a lot easier to serve to groups because people can cut square servings instead of trying to make sure they get a whole rolled enchilada (it helps avoid the “oops, sorry I cut into your enchilada”). Make the meat mix just as described above. Pour the first layer of enchilada sauce along the bottom. Instead of rolling the enchiladas, place enchiladas flat along the bottom so that small parts of each tortilla overlaps the one next to it. Place 1/3 of the meat mix along the tortillas. Make another layer of tortillas over the meat mix. Spread another 1/3 of the meat mix over the second layer of tortillas. Place a third layer of tortillas over the meat mix. Spread the final 1/3 of the meat mix over the last layer of tortillas. Pour the remaining enchilada sauce over the meat mix. Cover the entire casserole with a layer of shredded cheese.